May 30, 2013 — Detailed analysis and review have borne out researchers’ initial interpretation of pebble-containing slabs that NASA’s Mars rover Curiosity investigated last year: They are part of an ancient streambed. The rocks are the first ever found on Mars that contain streambed gravels. The sizes and shapes of the gravels embedded in these conglomerate rocks — from the size of sand particles to the size of golf balls — enabled researchers to calculate the depth and speed of the water that once flowed at this location. Astronomers love to point their telescopes at the Ring Nebula. Located 2,000 light years away in the constellation Lyra, this ring of glowing gas has a distinctive elliptical shape when seen from Earth. But new images captured by the Hubble Space Telescope suggest that the nebula actually looks a lot more like a football or a misshapen doughnut. At first glance, it resembles a giant rose, surrounded by green foliage. In high-resolution pictures and video, scientists say the hurricane’s eye is about 1,250 miles (2,000 kilometers) wide, 20 times larger than the average hurricane eye on Earth. 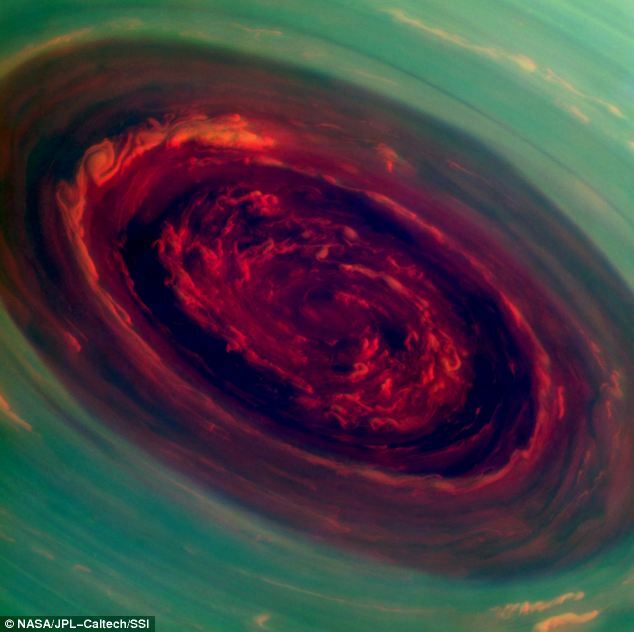 The spinning vortex of Saturn’s north polar storm resembles a deep red rose of giant proportions surrounded by green foliage in this false-color image from NASA’s Cassini spacecraft. Measurements have sized the eye at a staggering 1,250 miles (2,000 kilometers) across with cloud speeds as fast as 330 miles per hour (150 meters per second). Thin, bright clouds at the outer edge of the hurricane are traveling 330 mph(150 meters per second). The hurricane swirls inside a large, mysterious, six-sided weather pattern known as the hexagon. ‘We did a double take when we saw this vortex because it looks so much like a hurricane on Earth,’ said Andrew Ingersoll, a Cassini imaging team member at the California Institute of Technology in Pasadena. Scientists will be studying the hurricane to gain insight into hurricanes on Earth, which feed off warm ocean water. Corrupted files may be the fault of cosmic radiation. NASA’s Mars rover Curiosity paused its work over the weekend and is chilling in safe mode on Mars, while engineers on Earth try to resolve a computer glitch. The rover switched to a backup computer, but operations are on hiatus while NASA engineers work on the problem. Last week, engineers noticed a glitch in the flash memory on one of the rover’s two computers. Curiosity had normal communications with Earth on Wednesday, Feb. 27, but like an annoying Facebook friend, it updated its status yet included no actual information. In the status update, engineers learned the rover did not go to sleep when planned, and when they started diagnosing the problem, they realized the main A-side computer had some corrupted files. Feb. 20, 2013 — NASA’s Mars rover Curiosity has relayed new images that confirm it has successfully obtained the first sample ever collected from the interior of a rock on another planet. No rover has ever drilled into a rock beyond Earth and collected a sample from its interior. Transfer of the powdered-rock sample into an open scoop was visible for the first time in images received Wednesday at NASA’s Jet Propulsion Laboratory in Pasadena, Calif. The drill on Curiosity’s robotic arm took in the powder as it bored a 2.5-inch (6.4-centimeter) hole into a target on flat Martian bedrock on Feb. 8. The rover team plans to have Curiosity sieve the sample and deliver portions of it to analytical instruments inside the rover.